Compliance Alert: CalChamber's 2019 poster includes increases to the minimum wage effective July 1, 2018. * The $13.25/hour rate applies to employers with 26 or more employees; $12.00/hour rate applies to employers with 25 or fewer employees. 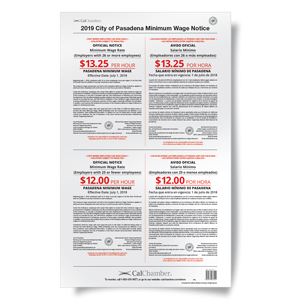 CalChamber’s 16” x 28” Pasadena Minimum Wage poster (English and Spanish combined) contains the official notice with the current minimum wage rates as required by the City of Pasadena Minimum Wage Ordinance. Every employer must post the minimum wage notice published each year by the City of Pasadena in a clearly visible place at any workplace or job site where any employee works. Employers who fail to comply with Pasadena's minimum wage ordinance may be subject to criminal prosecution, administrative proceedings, fines and civil penalties, and civil actions. Employers must post this notice in all languages spoken by more than 5 percent of employees. *If you currently use the July 2018 poster from CalChamber, you can continue to use it until June 30, 2019. The minimum wage rate will increase on July 1, 2019, at which time a new poster will be required. Poster Protect® coverage is not available for city and county posters. If you know you will need this product every year and would like to avoid the hassle of reordering, please check the box to sign up for Auto-Ship. With Auto-Ship, we will automatically send you next year’s product when it becomes available. Please note that the prices of Auto-Ship items are subject to change. We will remind you of the products that you will be receiving as well as provide information regarding price changes prior to shipping the products. You can modify or cancel your Auto-Ship order any time before the item ships.